Biography: REAL India stands for Rural Evangelism and Adult Literacy India, and is an interdenominational Christian organization started in 1997 dedicated to presenting Jesus Christ to this generation by obeying the great commission in preaching the Gospel, and making disciples through teaching and challenging the Body of Christ to become active in missions and evangelism. Jayakumar and Sujatha Rani are committed to be with Jesus and to move in the power of the Holy Spirit in ministry to equip, mobilize, serve, and to help organize events for people so that the lost can be reached and God's kingdom established in their hearts. The ministry holds camps monthly for children, reaching them and their families with the Word, the compassion, and love of Christ. 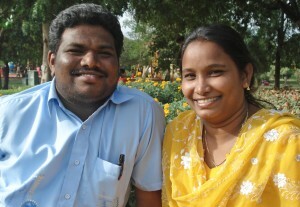 Strengths: Jayakumar and Sujatha Rani are strong leaders gifted in teaching and preaching.